Who’s to Blame: The Letter of the Law or its Application? In late July, the Federal Court of Canada released its judgement Brown v Canada (Ministers of Citizenship and Immigration and Public Safety and Emergency Preparedness), 2017 FC 710 (Brown). This decision is another entry in an ongoing debate about the legality of potentially indefinite immigration detention. In sum, Federal Court Justice Fothergill found that the immigration detention regime is constitutional, and that any shortcomings in the system are due to the policy being mismanaged. This decision was based on his assessment that the immigration regime has a quasi-judicial review process which provides a mechanism for an oral hearing by an impartial decision-maker and allows the detainee to both know and respond to the case against her/him. Advocates for detainees were disappointed, but not surprised. The Federal Court has been insisting for years that due to the specific and multifaceted considerations that go into each immigration detention decision, especially when issues of identity or security are involved, that continued detention is justified. However, many are becoming disheartened at a process that - while it may be constitutional to the hard letter of the law - is often flagrantly abused. To further continue the discussion, the Federal Court has certified a question to a higher court asking whether the Constitution requires there be a maximum amount of time for an individual to be detained for immigration purposes. This question both compliments and expands on the certified question put forward in 2016’s Lunyamila (2016 FC 1199) decision, which asked whether continued detention can be justified in circumstances where an individual’s lack of cooperation is the reason for their detention, even where it appears that the detention may indeed become indeterminate. Both questions are still awaiting an answer. 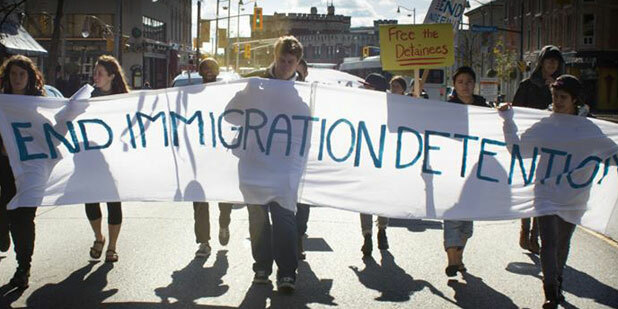 The immigration detention regime is statutorily empowered by the Immigration and Refugee Protection Act and enforced by the Canada Border Services Agency (CBSA). This regime permits foreign nationals and Canadian permanent residents to be detained if CBSA has reasonable grounds to believe that the person is unlikely to appear for an examination, hearing or removal or is a danger to the public; or reasonable grounds to suspect that the person is inadmissible for security reasons, or for violating human or international rights, serious criminality, criminality or organised criminality. Furthermore, individuals may also be detained if immigration and/or CBSA officers are not satisfied that a foreign national has established her or his identity. These provisions also apply to children, who may also be detained if their identity cannot be established, CBSA considers them a flight risk, or if their parents are detained (where they are considered ‘guests’). When CBSA detains someone, the Immigration Division (ID) of the Immigration and Refugee Board of Canada must hold a ‘detention review’ within the first 48 hours of their detention. If detention is found to be justified, a second hearing must be held within 7 days of the first, and then every 30 days thereafter. These reviews are adversarial: an ID adjudicator hears arguments both from the Crown (oftentimes represented by Hearing Officers) and from the detained individual, and determines whether the individual should go free or continue their detention. Subsequent detention reviews must defer to prior detention reviews unless there are “clear and compelling reasons” for them to depart. While some metropolitan areas have separate immigration detention facilities, many individuals are actually detained in provincial prisons. This is because the number of foreign nationals and Canadian permanent residents detained by CBSA every year is much greater than the number of spaces available in these specialized facilities. As such, some detainees may even find themselves in maximum security prisons alongside dangerous offenders. However, unlike these offenders, no independent decision-maker has found them guilty beyond a reasonable doubt: as indicated earlier, mere suspicion is enough to hold individuals for immigration detention purposes. Unlike our allies, where foreign nationals may only be detained for immigration purposes up to a maximum of 60 days (Mexico), 6 months (US), or even 18 months (EU), Canada has no such limit. While many immigration detainees gain their freedom within a few weeks or months, some individuals – often those who have been issued danger opinions – have languished in Canadian prisons for years. For example, Alvin Brown - the plaintiff in the most recent case - was imprisoned for over 5 years before finally being deported to his country of origin. The longest immigration detention victim, Mr. Kashif Ali, was released earlier in July after seven years of immigration detention in a maximum-security jail after Ontario Superior Court Justice Nordheimer granted his habeus corpus application. Unlike the criminal justice system, where it is the Crown who must prove the accused’s guilt beyond a reasonable doubt, the immigration detention regime has switched the onus (or who must prove what) from the Crown to the detainee. As a result, instead of the Crown having to undoubtedly justify continued detention, the detainee must instead demonstrate that they deserve to be released, and/or that release conditions will sufficiently overcome the reason they were detained in the first place. Three considerations further exacerbate this burden: Crown arguments are generally taken as fact and are not required to be proven or justified. Disclosure is often not provided to detainees, so they oftentimes don’t know what information the Crown is relying on to come to its conclusion and therefore cannot effectively rebut. Finally, subsequent detention reviews, while not bound by previous decisions, must nevertheless take these considerations into account. If each previous concern is not specifically addressed, subsequently issued release orders can be appealed. In this scenario, the Crown would likely file for a stay of the release order, meaning that the individual would remain detained throughout the appeal process. Oftentimes, even if the appeal is denied, the appeal decision-maker considers the previous release order a moot point as a new detention review already has or will shortly take place. As a result, there is a possibility of individuals remaining detained even if a valid release order has been issued, as the detainee becomes caught in the release-appeal-stay of release cycle. IV. The ID has no obligation to fashion alternatives to detention. a) Challenges to the fairness of the process leading to possible deportation and the loss of liberty associated with detention raise important issues of liberty and security, and s 7 of the Charter is engaged (at para 18). b) Section 7 of the Charter requires not a particular type of process, but a fair process having regard to the nature of the proceedings and the interests at stake (at para 20). d) Detention is not arbitrary where there are standards that are rationally related to the purpose of the power of detention (at para 89). Whether through habeas corpus or statutory mechanisms, foreign nationals, like others, have a right to prompt review to ensure that their detention complies with the law (at para 90). II. While agreeing that there are legitimate concerns about the timeliness and quality of pre-hearing disclosures, Justice Fothergill once again attributed this to maladministration rather than statutory unconstitutionality. He recommended that inadequate disclosure could be addressed by asking for brief adjournments to permit counsel to review documents brought to the hearing; to request that future review dates be brought forward; and that in egregious cases expedited judicial review applications may be filed. III. Justice Fothergill determined that it is not unconstitutional that the ID has no jurisdiction over the location and conditions of detention, so long as they consider the availability, effectiveness, and appropriateness of alternatives to detention during the detention review. If a detainee wishes to challenge the location and/or conditions of their detention, this could be done in other venues against CBSA. IV. While the ID has a positive obligation to consider alternatives to detention, this obligation is only engaged after the Crown has made a prima facie case for detention. As such, alternatives to detention are not required to be considered as a stand-alone concept: they must always be weighed against detention. Brown also argued that not having a maximum cap for immigration detention is unconstitutional. He advocated for a 6-month cap for immigration purposes, and an 18-month cap for removal orders. However, Justice Fothergill found that because “the question of when detention for immigration purposes is no longer reasonable does not have a single, simple answer...” and that because IRPA includes a (what he determines to be) effective review mechanism, that the fact that there is no maximum time cap is not, in fact, unconstitutional. Does the Canadian Charter of Rights and Freedoms, Part I of the Constitution Act, 1982, being Schedule B to the Canada Act, 1982 (UK), 1982, c 11 impose a requirement that detention for immigration purposes not exceed a prescribed period of time, after which it is presumptively unconstitutional, or a maximum period, after which release is mandatory? What Factors Are Considered in Upholding Indefinite Detention? Misrep. No 2014-2015 All inadmissibility hearings should consider all relevant immigration proceedings Criminals and Security Threats given more weight to continued detention. Refugee claims given more weight to release. N/A Claim began as Express Entry claim, but after being detained claimants filed refugee claim. Danger to the public, flight risk Yes 2013-2014 When determining indefinite nature of detention, can only assess facts as they currently exist; cannot rely on anticipation of future processes if they are not already occurring. Danger to the public, flight risk Yes 2013-2015 Indeterminate nature of detention one factor among many When indefinite detention found, higher responsibility to look for alternatives to detention, specifically release conditions. Danger to public, flight risk Yes 2013-2016 Indeterminate nature of detention, danger posed, flight risk posed, level of cooperation & its impacts on delay, available alternatives to detention which mitigate day-to-day dangers, Continued detention is justified where: 1. Detention arises from individual’s refusal to cooperate;2. Lack of cooperation impedes any steps that may realistically contribute in a meaningful way to effecting individual’s removal; AND3. Where individual has been designated as a danger to the public OR are subject to a validly-issued removal order and are deemed a flight risk. Risk to public danger given considerable weight. Must be restrained by pre-established conditions which mitigate the ‘day to day’ dangers posed Refusing to sign release documents required by airline; and failing to reach out to country of origin to help coordinate return, considered non-cooperation. Once the Minister establishes a prima facie case for continued detention based on the uncontested danger to the public and flight risk posed by the applicant, the onus then shifts to the applicant to establish grounds for release. Minister entitled to exhaust likely leads before pursuing alternatives. * Green signifies good law, whereas red signifies overturned law. Please note that Canada (Sécurité publique et Protection civile) c Chipovalov, 2017 CF 623. is not included in this chart. Brown and the End Immigration Detention Now Network intend to appeal the Brown decision. Two certified questions: one of general import on maximum timelines, the other applicable solely to indefinite detention for those who “don’t cooperate” have been put forth, although neither have been answered. The Government continues to host open consultations to examine public opinion on immigration detention. If you are currently in immigration detention, or at risk of being detained, please contact a Canadian immigration lawyer today.